Rinaudo’s Reproductions was founded to meet the need for restoration of antique Victorian lighting fixtures in private homes and historical landmarks. The knowledge and expertise we have gained from working with these fixtures has enabled us to design and manufacture our own line of exquisite chandeliers, sconces, pendants and lanterns. These fixtures have been installed in the world’s finest hotels, restaurants, and amusement parks and now through the magic of the internet these fixtures are available for your private residence. Each fixture is hand crafted using the finest quality materials and finished to the highest standards of both beauty and longevity. These fixtures, while expressing the flair and style of yesterday, are crafted to meet today’s standards and are U.L. listed for quality and safety. 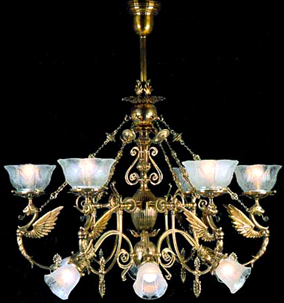 Whether you’re looking for Victorian reproductions from the gas light era, exterior fixtures ranging in design from Gothic European to American Arts and Crafts, or restoration and duplication of antique fixtures, Rinaudo’s Reproductions will be more than happy to help you with your needs. Rinaudo’s Reproductions: Respect for the past and lasting satisfaction for the future.